Signed as an Unrestricted Free Agent (no compensation) from the Edmonton Oilers, 08/23/00. Boyd was Edmonton's first choice (sixth overall) in the 1996 Entry Draft. In 1997-98, he played in 38 games and tallied five points (one goal, four assists). In 1998-99, Boyd played in 61 games, scoring six goals and adding eight assists. In 1999-2000, he played 76 games netting eight goals and 19 assists. Boyd signed as a free agent with Detroit on August 23, 2000. 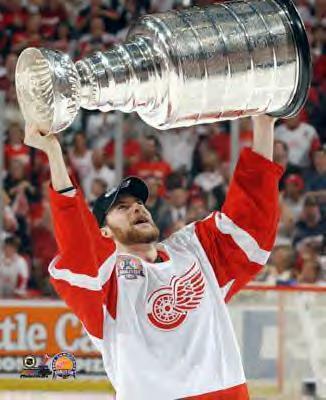 That year, Boyd played 55 games and helped the Red Wings win the Central Division title. Prior to making his NHL debut, Boyd played two seasons for the Kitchener Rangers of the OHL. He played a career-best 66 games during his rookie season in 1995-96, scoring 20 goals and 38 assists. He was also named the 1995-96 OHL and CHL Scholastic Player of the Year. In 1996-97, Boyd posted career-highs in goals (28), assists (41), points (69), and penalty minutes (37), before joining Hamilton of the AHL for a playoff game. Boyd was a key member of Canada's gold-medal winning team at the 1997 World Junior Championships, where he played in seven games and scored four goals. One of his goals was the game-winner in the semifinals vs. Russia while another won the championship game against the United States. Boyd hails from Seaforth, Ontario. Little known fact Boyd has scored 35 goals in his NHL career 10 of the goals being game winners. Boyd scored his 10th GWG last night 112903 against the St. Louis Blues. :) CONGRATS BOYD!!! Did you know Boyd's first NHL game was October 5, 1997 as an Oiler and his first game as a Detroit Red Wing was October 5, 2000. Boyd's father's name is Ken, his mothers name is Lorraine. He has one sister named Kathy and one brother named Mike. Boyd's favorite sitcom is "Everybody Loves Raymond". Boyd's favorite band is TOOL. On the road Boyd's roommate is Mathieu Dandenault. On the road Boyd and Mathieu compare themselves to Joey & Chandler from FRIENDS. Growing Up Boyd's favorite player was non other then #19 Steve Yzerman. Boyd wore #19 in Edmonton in honor of Yzerman. Hobbies include going to concerts and playing his guitar. Boyd serves as team spokesman for the Boys and Girls Club of Southeastern Detroit. Other then hockey Boyd likes Baseball & Football, as a sport.